When the day is winding down and just before Scottie Mom retreats to the other room to write up a Scottie tale for Heather and Mr. K's new friends every night, Mr. K makes sure some quality CT (cuddle time) is achieved while his mom and dad watch an hour or so of television together. Alas, snuggling against Scottie Mom's side or keeping her toes warm is almost never enough for Mr. K. He not only likes to hang out with his hoomans but actually insists on sitting around like one and enjoying whatever show Scottie Mom and Dad are watching. This feat is usually achieved one of two ways: by climbing on Scottie Mom's belly and sit facing the television or approaching Scottie Mom and staring her down until she gets the message that it is time to cuddle. When she gets his message, Scottie Mom then pulls Mr. K close and he lies back like he's a baby in his mama's arms (which, of course, he is!). Friends and family who get to witness this bonding moment often get a good laugh as Mr. K is known to sit like this for hours on end, seeing the show or movie through to its finish and often times, even after Scottie Mom's arm has long since fallen asleep. 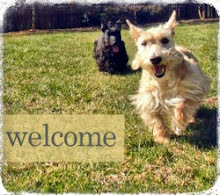 But both he and Scottie Mom agree: the experience is totally worth it! Ha too cute! @AbbyMcScottie also likes to watch TV. She "sits like a person" at one end of the couch, with her front left paw on the armrest. My Hootmon (aka Hootie) also sits like a "hooman". I had 2 Scots before him and he's the first to do this. But what he doesn't do....at least not yet and he just celebrated his 1st birthday... is "arooo". My other two did! Go figure! Oh no....no aroooooos! I LOVE them. My old man, Macalister (nearly 14), has a beautiful, some times mournful aroooooooo. My girl Maggie does not arooooo though. Ironically, neither Mr. K or Heather "arooo" in person...only via the blog! The first time I heard about "arooos," Heather's foster dad and signed something, "From the arooo crew." 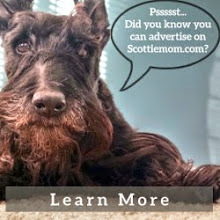 I could only assume at the time that he meant his Scottie family but I didn't know of the Scottie "arooo" until then! 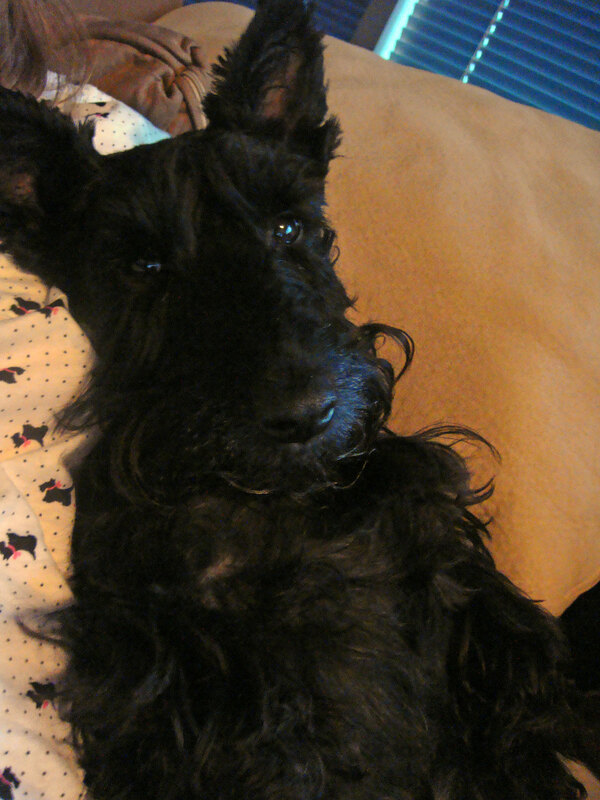 Keegan, my Scottie sits next to me with his front paws on my lap...He is only too happy to jump up on the bed when I pat the bed and say "Come up and see your Mom!" By the way Scottie Mom, I have that same Scottie shirt that you have on in this picture! !